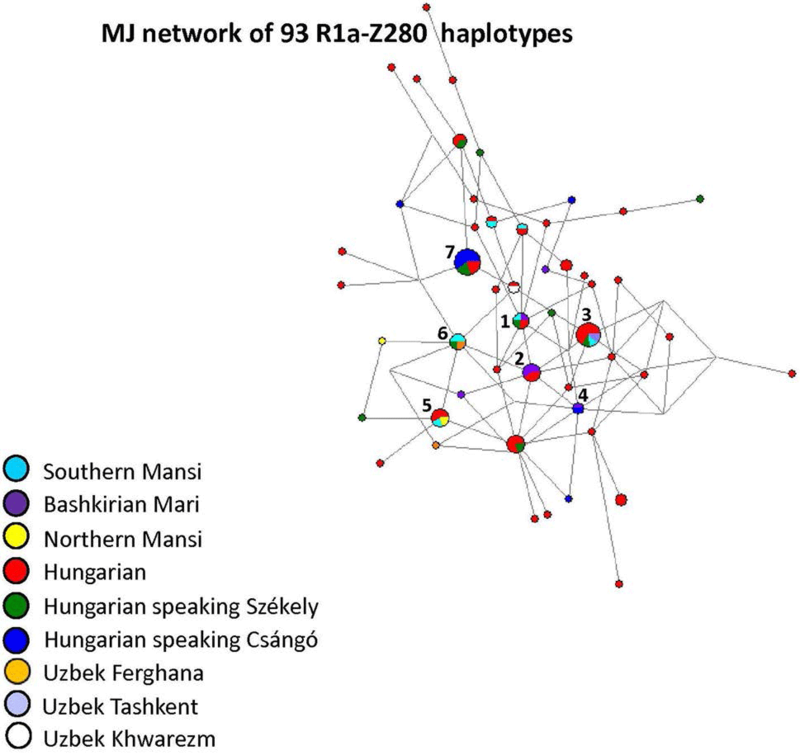 First look of an accepted manuscript (behind paywall), Genome-wide sequence analyses of ethnic populations across Russia, by Zhernakova et al. Genomics (2019). There remain ongoing discussions about the origins of the ethnic Russian population. The ancestors of ethnic Russians were among the Slavic tribes that separated from the early Indo-European Group, which included ancestors of modern Slavic, Germanic and Baltic speakers, who appeared in the northeastern part of Europe ca. 1,500 years ago. Slavs were found in the central part of Eastern Europe, where they came in direct contact with (and likely assimilation of) the populations speaking Uralic (Volga-Finnish and Baltic- Finnish), and also Baltic languages [11–13]. 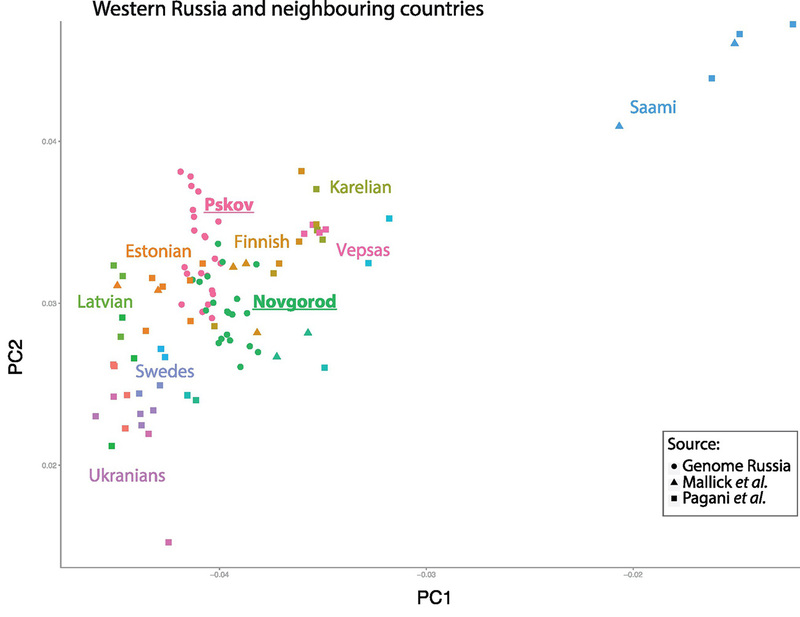 In the following centuries, Slavs interacted with the Iranian-Persian, Turkic and Scandinavian peoples, all of which in succession may have contributed to the current pattern of genome diversity across the different parts of Russia. At the end of the Middle Ages and in the early modern period, there occurred a division of the East Slavic unity into Russians, Ukrainians and Belarusians. 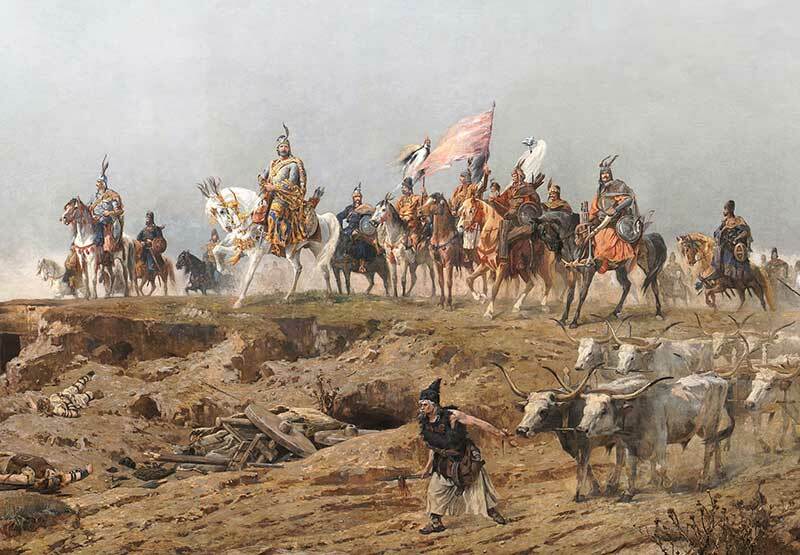 It was the Russians who drove the colonization movement to the East, although other Slavic, Turkic and Finnish peoples took part in this movement, as the eastward migrations brought them to the Ural Mountains and further into Siberia, the Far East, and Alaska. During that interval, the Russians encountered the Finns, Ugrians, and Samoyeds speakers in the Urals, but also the Turkic, Mongolian and Tungus speakers of Siberia. Finally, in the great expanse between the Altai Mountains on the border with Mongolia, and the Bering Strait, they encountered paleo-Asiatic groups that may be genetically closest to the ancestors of the Native Americans. 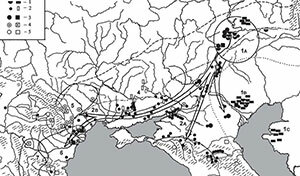 Today’s complex patchwork of human diversity in Russia has continued to be augmented by modern migrations from the Caucasus, and from Central Asia, as modern economic migrations take shape. Sample relatedness based on genotype data. Eurasia: Principal Component plot of 574 modern Russian genomes. Colors reflect geographical regions of collection; shapes reflect the sample source. 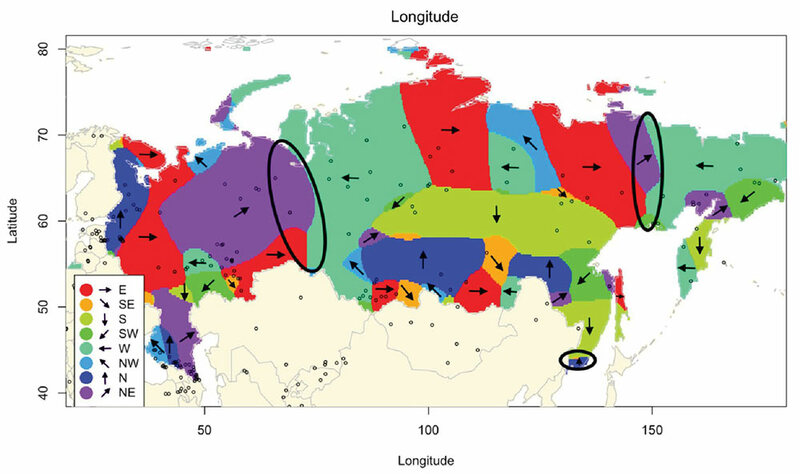 Red circles show the location of Genome Russia samples. 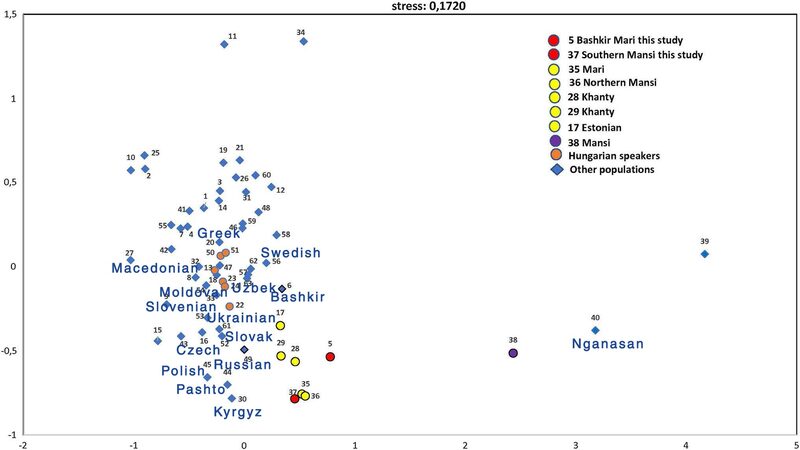 In the current study, we annotated whole genome sequences of individuals currently living on the territory of Russia and identifying themselves as ethnic Russian or as members of a named ethnic minority (Fig. 1). 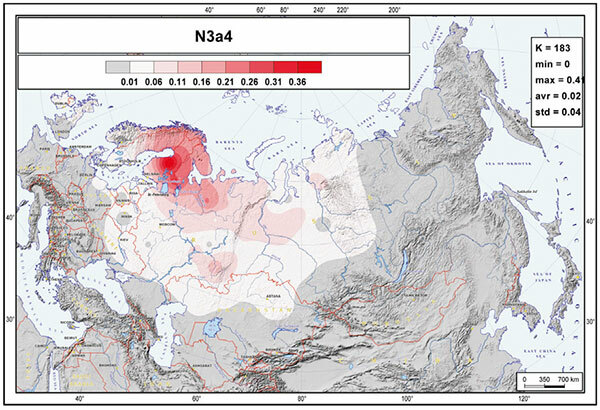 We analyzed genetic variation in three modern populations of Russia (ethnic Russians from Pskov and Novgorod regions and ethnic Yakut from the Sakha Republic), and compared them to the recently released genome sequences collected from 52 indigenous Russian populations. 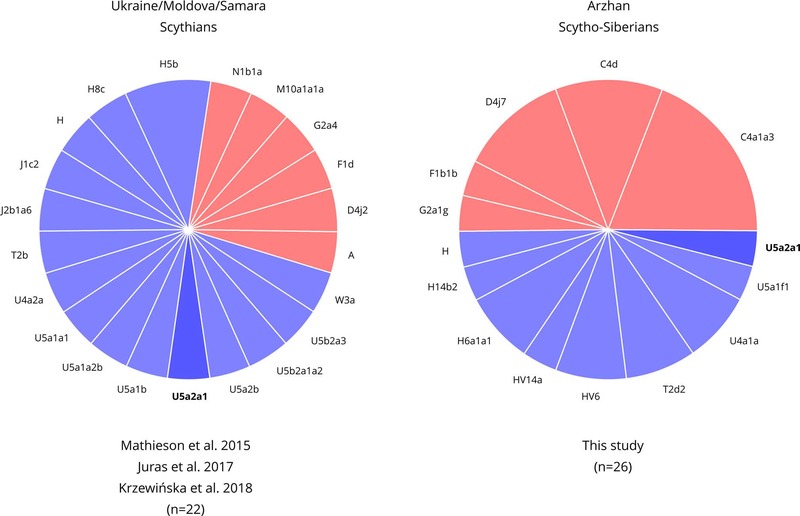 The incidence of function-altering mutations was explored by identifying known variants and novel variants and their allele frequencies relative to variation in adjacent European, East Asian and South Asian populations. 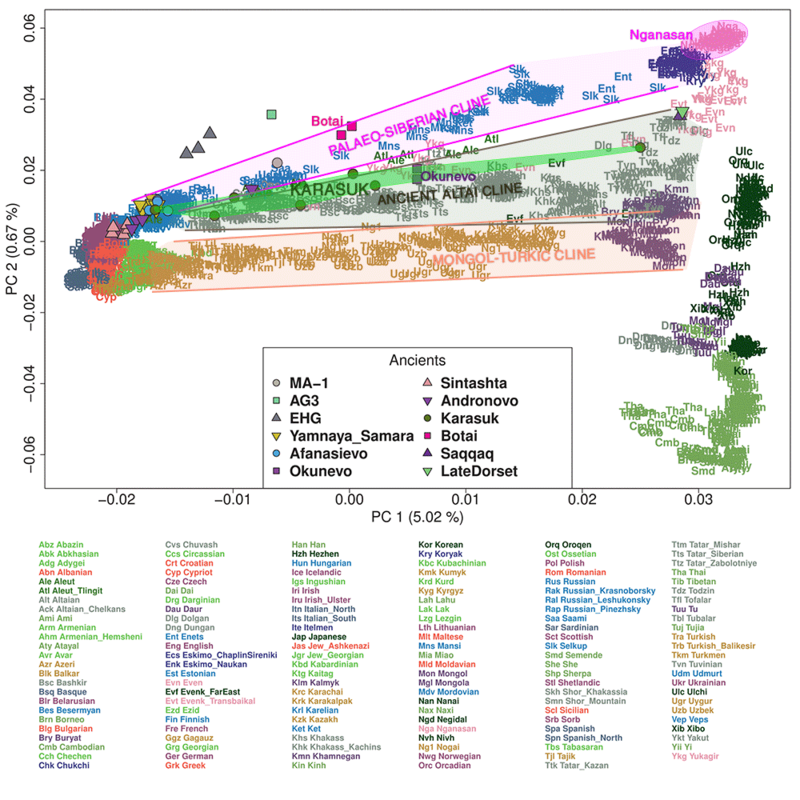 Genomic variation was further used to estimate genetic distance and relationships, historic gene flow and barriers to gene flow, the extent of population admixture, historic population contractions, and linkage disequilibrium patterns. Lastly, we present demographic models estimating historic founder events within Russia, and a preliminary HapMap of ethnic Russians from the European part of Russia and Yakuts from eastern Siberia. Sample relatedness based on genotype data. Western Russia and neighboring countries: Principal Component plot of 574 modern Russian genomes. Colors reflect geographical regions of collection; shapes reflect the sample source. Red circles show the location of Genome Russia samples. 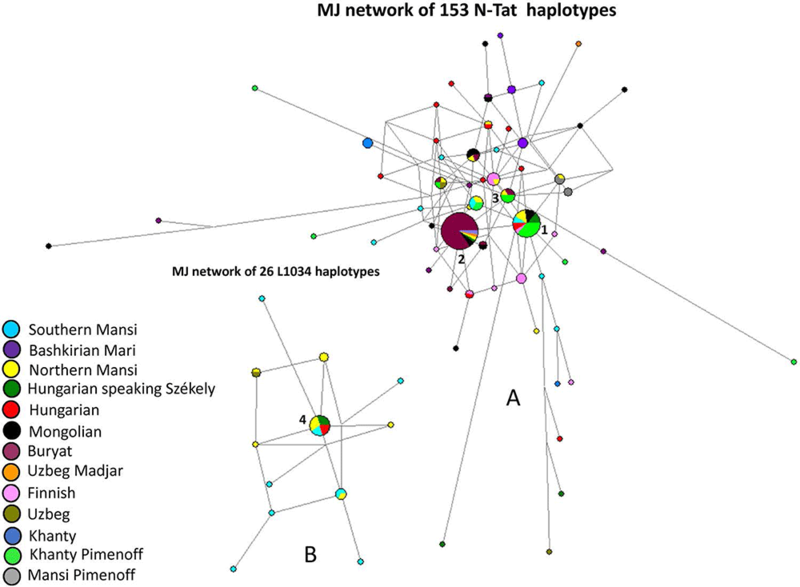 The collection of identified SNPs was used to inspect quantitative distinctions among 264 individuals from across Eurasia (Fig. 1) using Principal Component Analysis (PCA) (Fig. 2). The first and the second eigenvectors of the PCA plot are associated with longitude and latitude, respectively, of the sample locations and accurately separate Eurasian populations according to geographic origin. East European samples cluster near Pskov and Novgorod samples, which fall between northern Russians, Finno-Ugric peoples (Karelian, Finns, Veps etc. ), and other Northeastern European peoples (Swedes, Central Russians, Estonian, Latvians, Lithuanians, and Ukrainians) (Fig. 2b). 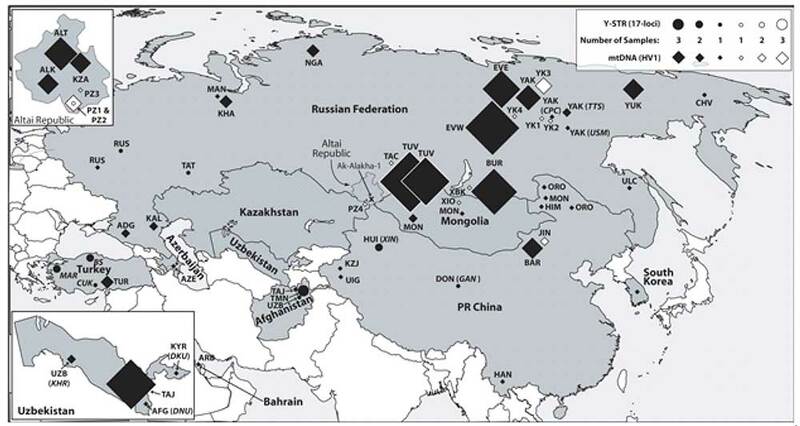 Yakut individuals map into the Siberian sample cluster as expected (Fig. 2a). To obtain an extended view of population relationships, we performed a maximum likelihood-based estimation of ancestry and population structure using ADMIXTURE (Fig. 2c). The Novgorod and Pskov populations show similar profiles with their Northeastern European ancestors while the Yakut ethnic group showed mixed ancestry similar to the Buryat and Mongolian groups. Population structure across samples in 178 populations from five major geographic regions (k=5). 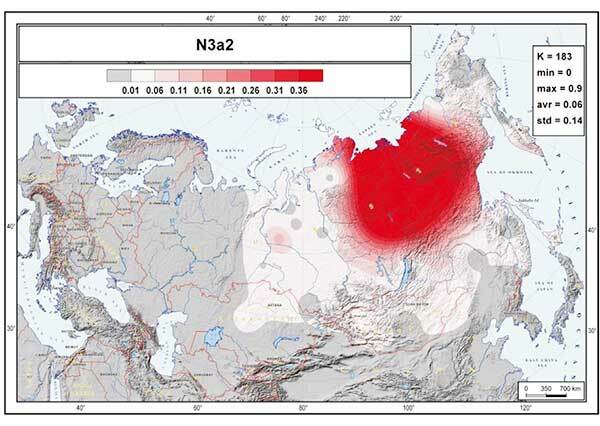 Samples are pooled across three different studies that covered the territory of Russian Federation (Mallick et al. 2016 , Pagani et al. 2016 , this study). 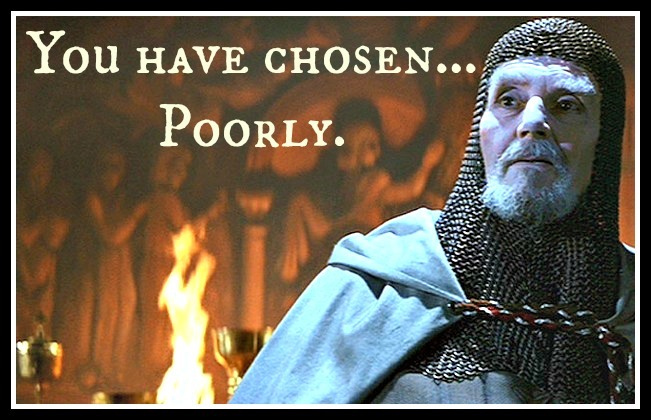 The optimal k-value was selected by value of cross validation error. Russian samples from all studies (highlighted in bold dark blue) show a slight gradient from Eastern European (Ukrainian, Belorussian, Polish) to North European (Estonian Karelian, Finnish) structures, reflecting population history of northward expansion. Yakut samples from different studies (highlighted in bold red) also show a slight gradient from Mongolian to Siberian people (Evens), as expected from their original admixture and northward expansions. The samples originated from this study are highlighted, and plotted in separated boxes below. 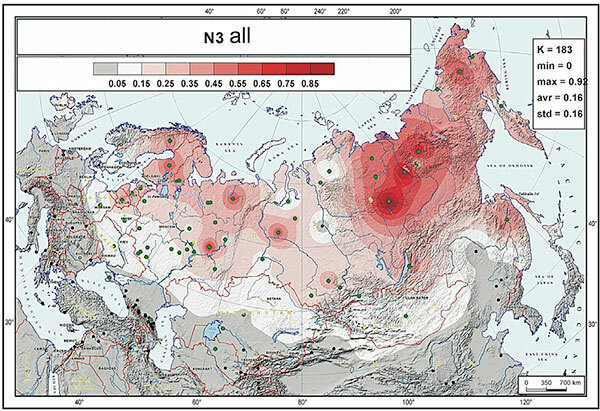 Possible admixture sources of the Genome Russia populations were addressed more formally by calculating F3 statistics, which is an allele frequency-based measure, allowing to test if a target population can be modeled as a mixture of two source populations . 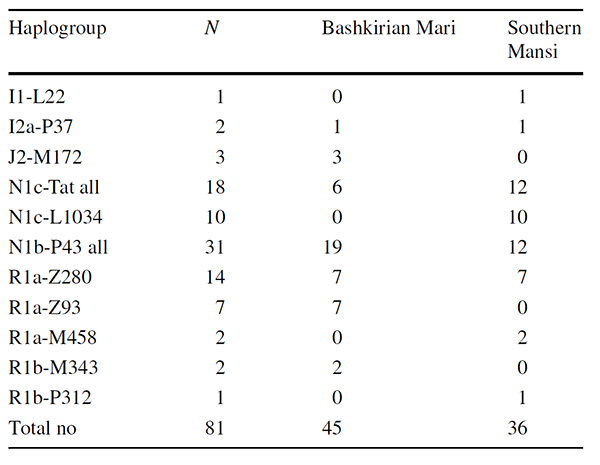 Results showed that Yakut individuals are best modeled as an admixture of Evens or Evenks with various European populations (Supplemental Table S4). Pskov and Novgorod showed admixture of European with Siberian or Finno-Ugric populations, with Lithuanian and Latvian populations being the dominant European sources for Pskov samples. The heatmaps of gene flow barriers show for each point at the geographical map the interpolated differences in allele frequencies (AF) between the estimated AF at the point with AFs in the vicinity of this point. The direction of the maximal difference in allele frequencies is coded by colors and arrows. So, Russians expanding in the Middle Ages as acculturaded Finno-Volgaic peoples. 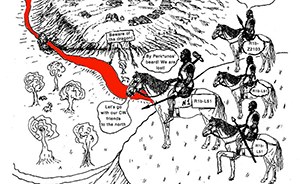 Or maybe the true Germano-Slavonic™-speaking area was in north-eastern Europe, until the recent arrival of Finno-Permians with the totally believable Nganasan-Saami horde, whereas Yamna -> Bell Beaker represented Vasconic-Caucasian expanding all over Europe in the Bronze Age. Because steppe ancestry in Fennoscandia and Modern Basques in Iberia. A really hard choice between equally plausible models. 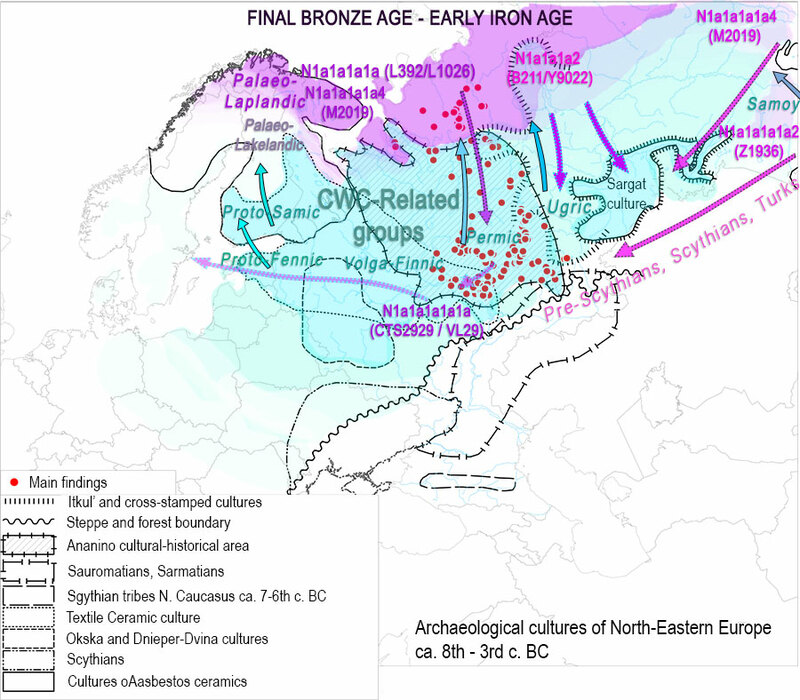 Matrilineal and patrilineal genetic continuity of two iron age individuals from a Pazyryk culture burial, by Tikhonov, Gurkan, Peler, & Dyakonov, Int J Hum Genet (2019). Of particular interest to the current study are the archaeogenetic investigations associated with the exemplary mound 1 from the Ak-Alakha-1 site on the Ukok Plateau in the Altai Republic (Polosmak 1994a; Pilipenko et al. 2015). This typical Pazyryk “frozen grave” was dated around 2268±39 years before present (Bln-4977) (Gersdorff and Parzinger 2000). 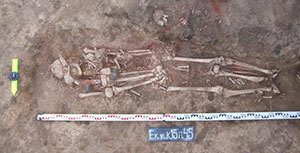 Initial anthropological findings suggested an undisturbed dual inhumation comprising “a middle-aged European- type man” and “a young European-type woman”, both of whom presumably had a high social status among the Pazyryk elite (Polosmak 1994a). In contrast, recent archaeogenetic investigations revealed somewhat contradicting results since analyses at both the amelogenin gene and Y-chromosome short tandem repeat (Y-STR) loci clearly established that both Scythians were actually males and had paternal and maternal lineages that are typically associated with eastern Eurasians (Pilipenko et al. 2015). Through the use of mitochondrial, autosomal and Y-chromosomal DNA typing systems, it was possible to not only investigate the potential relationships between the two ancient Scythians but also to gather initial phylogenetic and phylogeographic information on their paternal and maternal lineages (Pilipenko et al. 2015). 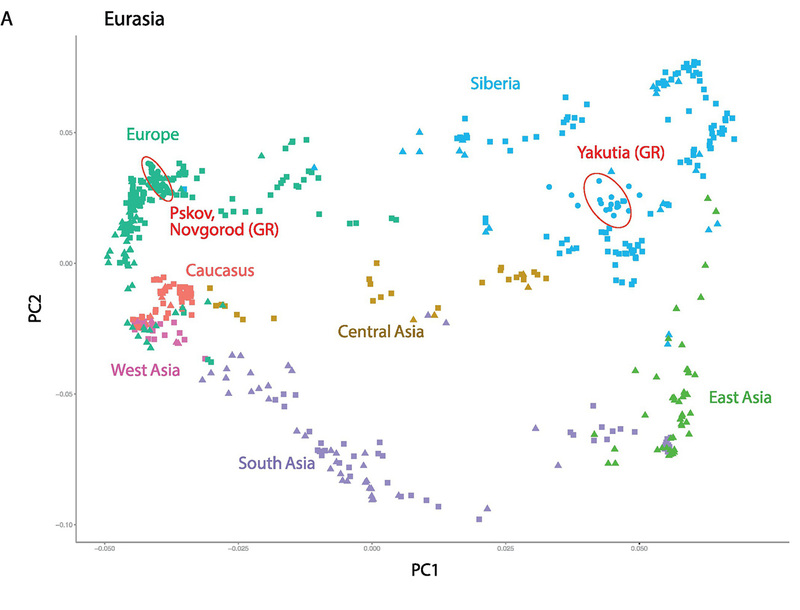 Based on the Y-STR data available, the two Ak-Alakha-1 Scythians had an in silico haplogroup assignment of N, which first appeared in southeastern Asia and then expanded in southern Siberia (Rootsi et al. 2007; Pilipenko et al. 2015). 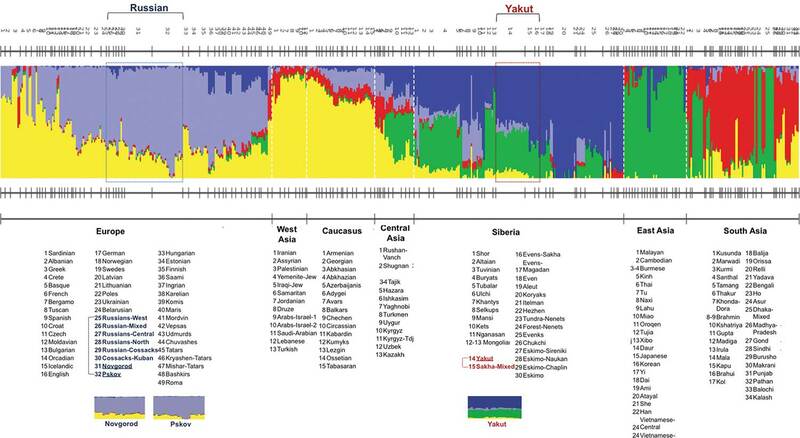 Current study aims to investigate the geographical distributions of the ancient and contemporary matches and close genetic variants of the maternal and paternal lineages observed in the two Scythians from the exemplary Ak-Alakha-1 kurgan. 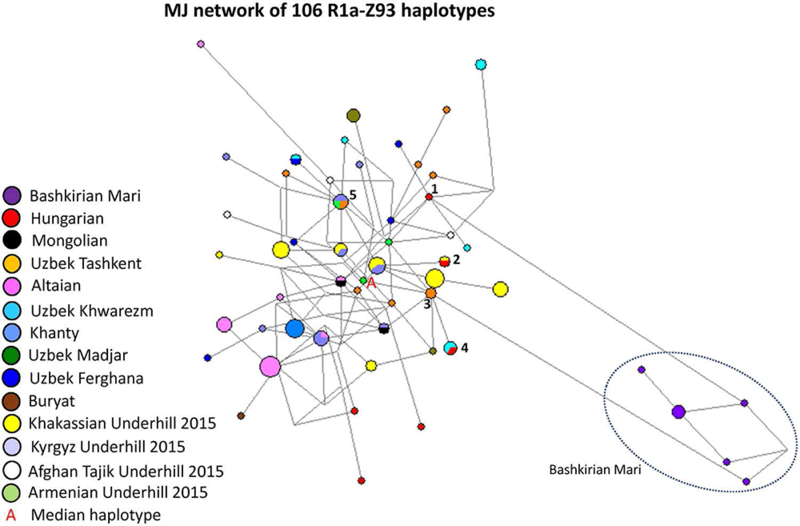 Geographic distribution of the exact matches with the Scythian (PZ1) Y-STR (17-loci) and mtDNA (HVR1) haplotypes detailed in Tables 1a and 1b. Boundaries of the Altai Republic within the Russian Federation are shown with dashed lines, along with an approximate position of the Ak-Alakha-1 burial site, which is denoted with an ‘x’ on the map. Countries shaded in gray refer to those that have full 17-loci Y-STR and/or mtDNA HVR1 match(es) with the PZ1 haplotypes. Inset in the top and bottom left corners are the Altai and Uzbekistan maps, respectively, both scaled-up to allow better representation of the samples derived from these countries. There were no other exact matches from around parts of the globe that are not shown on the map, except for a single contemporary mtDNA haplotype from US, which presumably belonged to an ‘East Asian’ individual. Inset in the top right corner provides a scale for the number of haplotypes observed, but only up to three samples, which is valid for the entire map as well as the inset maps, irrespective of the differences in the scales of the actual map and inset maps themselves. For sample pools larger than three, the same linear scale provided on the inset in the top right corner still applies; please refer to Tables 1a and b for actual sample pool sizes. Samples are depicted on the entire map and the insets maps with circles and diamonds for the Y-STR and mtDNA haplotypes, respectively. Black and white coloring for samples depict whether the haplotype(s) are contemporary or ancient, respectively. Location of the PZ1 mtDNA and Y-STR haplotypes are shown on top of each other. 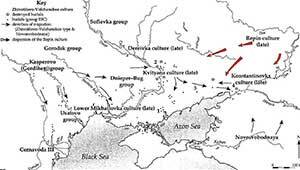 In response to aggressive Xiongnu expansion into the Altai region around the 2nd century BCE, some members of the Pazyryk culture may have started moving up North, and eventually reached the Vilyuy River at the beginning of 1st century CE. Notably, there is clear population continuity between the Uralic people such as Khants, Mansis and Nganasans, Paleo-Siberian people such as Yukaghirs and Chuvantsi, and the Pazyryk people even when considering just the two mtDNA and Y-STR haplotypes from the Ak-Alakha-1 mound 1 kurgan (Tables 1a, b, Table 2, Fig. 1). These concepts are also in agreement with the famous Yakut ethnographer Ksenofontov, who suggested that technologies associated with ferrous metallurgy were brought to the Vilyuy Valley at around 1st century CE by the first (proto)Turkic-speaking pioneers (Ksenofontov 1992). Yakut ethnogenesis per se possibly involved two major stages, the first being the proto-Turkic epoch through the arrival of Scytho-Siberian culture originating from Southern Siberia, such as that associated with the Pazyryk culture and the second being the proper Turkic epoch. Nomadic peoples from the Central Asian steppes are East Iranian speakers whenever they are of haplogroup R1a, but “Uralic-Altaic” speakers whenever they are of haplogroup N. True story. So they followed a haplogroup ca. 37,000 years old, in a sample dated some 2,300 years ago, whose precise subclade and ancient history is (yet) unknown, compared it to present-day populations, and the result is that they spoke “Uralic-Altaic” because haplogroup N and continuity. Sound familiar? Yep, it’s the kind of reasoning you might be reading right now about Iberian Bell Beakers, about Bell Beakers, or even about Yamna and their relationship to a Vasconic-Caucasian language, based on haplogroup R1b in modern Basques. Another true story. Uralic: based on the presence of other Uralic-speaking groups nearby in the Siberian forest-steppes, and on their Karasuk-like admixture in common with Eastern Uralians. In fact, we already have a Pazyryk sample of haplogroup R1a-Z2124 from Berel’ in the Altai region (ca. 4th-3rd c. BC) from Unterländer et al. (2017), which may correspond to Eastern Uralic peoples (as the Bronze Age expansion of R1a-Z645 up to the eastern steppes shows). The appearance of haplogroup N in elite individuals would be quite representative of the infiltration process that must have happened among Ugrians and Samoyeds, and among Finno-Permians in the west. Turkic: based on the presence of haplogroup N in West Siberian forest and forest-steppe groups – including Botai, which shows Y-DNA hg. R1b-M73 and N – because we really don’t know where Proto-Turkic comes from, and by the Iron Age (even if the connection with Eurasians speaking a Eurasiatic macro-language is correct) it could be associated with any (and possibly many) haplogroups, as the presence of R1a-Z645 lineages among Hunnic-Sarmatian groups show. 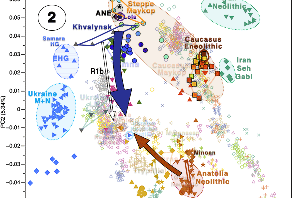 We also know that haplogroup N and Siberian ancestry expanded into cultures of Northern Eurasia precisely with the creation of the new social paradigm of chiefdoms and alliances, roughly at the same time as Scythians expanded, with the first sample of haplogroup N in Hungary appearing with Cimmerians. 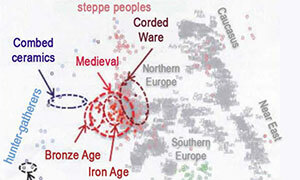 While the study of modern populations is interesting, the problem I have with the paper is the reasoning of “language of ancient haplogroups based on modern populations”, and especially with the concept of “Uralic-Altaic”, and the highly hypothetic “Proto-Turkic” nomadic steppe pastoralists before “Hunnic Turkic” (which is itself questionable), before the “real Turkic” layer (being the authors apparently Turkic themselves), and the supposed “continuity” of Eastern Uralic and Turkic groups in Asia since the Out of Africa migration. The combination of all of this in the same text is just disturbing. Happy new year 2019…and enjoy our new books! Sorry for the last weeks of silence, I have been rather busy lately. I am having more projects going on, and (because of that) I also wanted to finish a project I have been working on for many months already. Announcement and introduction to the series. 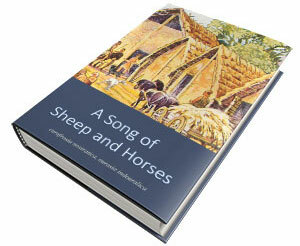 Book One: A Song of Sheep and Horses: eurafrasia nostratica, eurasia indouralica. Languages. Books Two & Three: A Game of Clans: collectores venatoresque, agricolae pastoresque & A Clash of Chiefs: rex militaris, rex sacrorum. Cultures and peoples. Book Four: A Storm of Hordes: hic sunt leones, hic sunt dracones. Maps and graphics. EDIT (20 JAN 2019): For those of you who are more comfortable reading in your native language, I have placed some links to automatic translations by Google Translate. They might work especially well for the texts of A Game of Clans & A Clash of Chiefs. 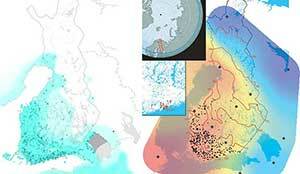 Don’t forget to check out the maps included in the supplementary materials: I have added Y-DNA, mtDNA, and ADMIXTURE data using GIS software. The PCA graphics are also important to follow the main text. NOTE. Right now the files are only in my server. I will try to upload them to Academia.edu and Research Gate when I have time, I have uploaded them to Academia.edu and ResearchGate, in case the websites are too slow. I say so in the introduction, but it is evident that certain aspects of the book are tentative to say the least: the farther back we go from Late Proto-Indo-European, the less clear are many aspects. Also, linguistically I am not convinced about Eurasiatic or Nostratic, although they do have a certain interest when we try to offer a comprehensive view of the past, including ethnolinguistic identities. NOTE. Since the first book I wrote was the linguistic one, and I have spent the last months updating the archaeology + genetics part, now many of you will probably understand 1) why I am so convinced about certain language relationships and 2) how I used many posts to clarify certain ideas and receive comments. Many posts offer probably a good timeline of what I worked with, and when. I did not add this section to the books, because they are still not ready for print, but I think this is due somewhere now. It is impossible to reference all who have directly or indirectly contributed to this, so this is a list of those I feel have played an important role. First and foremost, to Fernando López-Menchero, for having the patience to review with detail many parts on Indo-European linguistics, knowing that I won’t accept many of his comments anyway. The additional information he offers is invaluable, but I didn’t want to turn this into a huge linguistic encyclopaedia with unending discussions of tiny details of each reconstructed word. I think it is already too big as it is. I would not have thought about doing this if it were not for the interest of Wekwos (Xavier Delamarre) in publishing a full book about the Indo-European demic diffusion model (in the second half of 2017, I think). It was them who suggested that I extended the content, when all I had done until then was write an essay and draw some maps in my free time between depositing the PhD thesis and defending it. Sadly, as much as I would like to publish a book with a professional publisher, I don’t think ancient DNA lends itself for the traditional format, so my requests (mainly to have free licenses and being able to review the text at will, as new genetic papers are published) were logically not acceptable. Also, the main aim of all volumes, especially the linguistic one, is the teaching of essentials of Late Proto-Indo-European and related languages, and this objective would be thwarted by selling each volume for $50-70 and only in printed format. I prefer a wider distribution. At first I didn’t think much of this proposal, because I do not benefit from this kind of publications in my scientific field, but with time my interest in writing a whole, comprehensive book on the subject grew to the point where it was already an ongoing project, probably by the start of 2018. I would not have been in contact with Wekwos if it were not for user Camulogène Rix at Anthrogenica, so thanks for that and for the interest in this work. I would not have thought of writing this either if not for the spontaneous support (with an unexpected phone call!) of a professor of the Complutense University of Madrid, Ángel Gómez Moreno, who is interested in this subject – as is his wife, a professor of Classics more closely associated to Indo-European studies, and who helped me with a search for Indo-Europeanists. EDIT (1 JAN 2019): I remembered that Karin Bojs sent me her book after reading the demic diffusion model. I may have also thought about writing a whole book back then, but mid-2017 is probably too early for the project. Professor Kortlandt is still to review the text, but he contributed to both previous essays in some very interesting ways, so I hope he can help me improve the parts on Uralic, and maybe alternative accounts of expansion for Balto-Slavic, depending on the time depth that he would consider warranted according to the Temematic hypothesis. The maps are evidently (for those who are interested in genetics) in part the result of the effort of the late Jean Manco: As you can see from the maps including Y-DNA and mtDNA samples, I have benefitted from her way of organising data and publishing it. Similarly, the work of Iain McDonald in assessing the potential migration routes of R1b and R1a in Europe with the help of detailed maps was behind my idea for the first maps, and consequently behind these, too. I should thank all people responsible for the release of free datasets to work with, including the Reich and Jena labs, the Veeramah Lab, and also researchers from the Max Planck Institute or the Mainz Palaeogenetics group, who didn’t mind to share with me datasets to work with. Readers of this blog with interesting comments have also been essential for the improvement of the texts. You can probably see some of your many contributions there. I may not answer many comments, because I am always busy (and sometimes I just don’t have anything interesting to say), but I try to read all of them. Users of other sites, like Anthrogenica, whose particular points of view and deep knowledge of some very specific aspects are sometimes very useful. In particular, user Anglesqueville helped me to fix some issues with the merging of datasets to obtain the PCAs and ADMIXTURE, and prepared some individual samples to merge them. Even without posting anything, Google Analytics keeps sending me messages about increasing user fidelity (returning users), and stats haven’t really changed (which probably means more people are reading old posts), so thank you for that. I hope you enjoy the books. Open access paper Bronze Age population dynamics and the rise of dairy pastoralism on the eastern Eurasian steppe, by Jeong et al. PNAS (2018). To understand the population history and context of dairy pastoralism in the eastern Eurasian steppe, we applied genomic and proteomic analyses to individuals buried in Late Bronze Age (LBA) burial mounds associated with the Deer Stone-Khirigsuur Complex (DSKC) in northern Mongolia. To date, DSKC sites contain the clearest and most direct evidence for animal pastoralism in the Eastern steppe before ca. 1200 BCE. 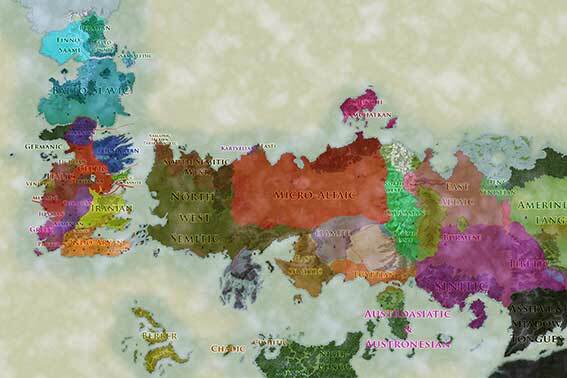 Most LBA Khövsgöls are projected on top of modern Tuvinians or Altaians, who reside in neighboring regions. In comparison with other ancient individuals, they are also close to but slightly displaced from temporally earlier Neolithic and Early Bronze Age (EBA) populations from the Shamanka II cemetry (Shamanka_EN and Shamanka_EBA, respectively) from the Lake Baikal region. However, when Native Americans are added to PC calculation, we observe that LBA Khövsgöls are displaced from modern neighbors toward Native Americans along PC2, occupying a space not overlapping with any contemporary population. Such an upward shift on PC2 is also observed in the ancient Baikal populations from the Neolithic to EBA and in the Bronze Age individuals from the Altai associated with Okunevo and Karasuk cultures. Image modified from the article. Karasuk cluster in green, closely related to sample ARS026 in red. Principal Component Analysis (PCA) of selected 2,077 contemporary Eurasians belonging to 149 groups. Contemporary individuals are plotted using three-letter abbreviations for operational group IDs. Group IDs color coded by geographic region. Ancient Khövsgöl individuals and other selected ancient groups are represented on the plot by filled shapes. Ancient individuals are projected onto the PC space using the “lsqproject: YES” option in the smartpca program to minimize the impact of high genotype missing rate. (…) two individuals fall on the PC space markedly separated from the others: ARS017 is placed close to ancient and modern northeast Asians, such as early Neolithic individuals from the Devil’s Gate archaeological site (22) and present-day Nivhs from the Russian far east, while ARS026 falls midway between the main cluster and western Eurasians. 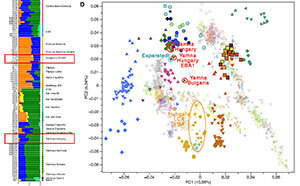 Upper Paleolithic Siberians from nearby Afontova Gora and Mal’ta archaeological sites (AG3 and MA-1, respectively) (25, 26) have the highest extra affinity with the main cluster compared with other groups, including the eastern outlier ARS017, the early Neolithic Shamanka_EN, and present-day Nganasans and Tuvinians (Z > 6.7 SE for AG3). Main cluster Khövsgöl individuals mostly belong to Siberian mitochondrial (A, B, C, D, and G) and Y (all Q1a but one N1c1a) haplogroups. The genetic affinity of the Khövsgöl clusters measured by outgroup-f3 and -f4 statistics. (A) The top 20 populations sharing the highest amount of >genetic drift with the Khövsgöl main cluster measured by f3(Mbuti; Khövsgöl, X). 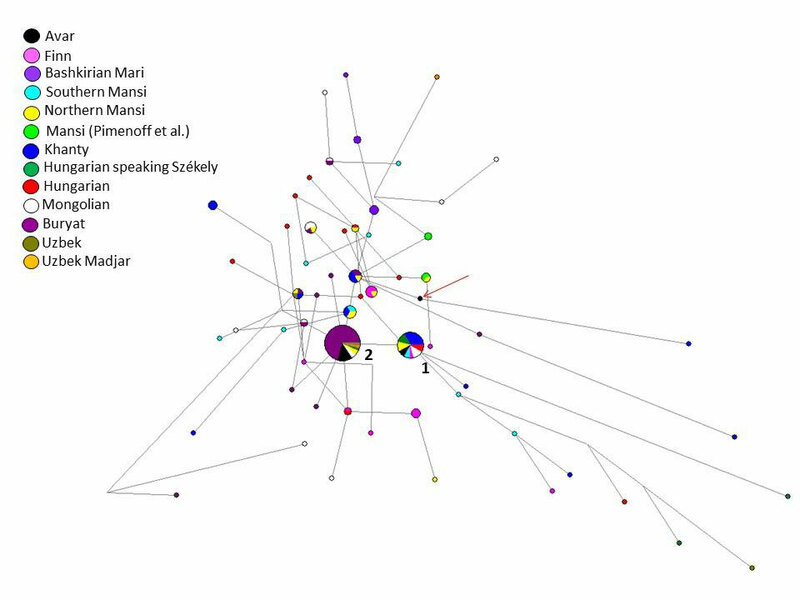 (B) The top 15 populations with the most extra affinity with each of the three Khövsgöl clusters in contrast to Tuvinian (for the main cluster) or to the main cluster (for the two outliers), measured by f4(Mbuti, X; Tuvinian/Khövsgöl, Khövsgöl/ARS017/ARS026). Ancient and contemporary groups are marked by squares and circles, respectively. Darker shades represent a larger f4 statistic. 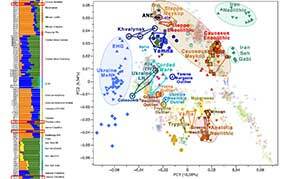 Previous studies show a close genetic relationship between WSH populations and ANE ancestry, as Yamnaya and Afanasievo are modeled as a roughly equal mixture of early Holocene Iranian/ Caucasus ancestry (IRC) and Mesolithic Eastern European hunter-gatherers, the latter of which derive a large fraction of their ancestry from ANE. It is therefore important to pinpoint the source of ANE-related ancestry in the Khövsgöl gene pool: that is, whether it derives from a pre-Bronze Age ANE population (such as the one represented by AG3) or from a Bronze Age WSH population that has both ANE and IRC ancestry. The amount of WSH contribution remains small (e.g., 6.4 ± 1.0% from Sintashta). Assuming that the early Neolithic populations of the Khövsgöl region resembled those of the nearby Baikal region, we conclude that the Khövsgöl main cluster obtained ∼11% of their ancestry from an ANE source during the Neolithic period and a much smaller contribution of WSH ancestry (4–7%) beginning in the early Bronze Age. Admixture modeling of Altai populations and the Khövsgöl main cluster using qpAdm. For the archaeological populations, (A) Shamanka_EBA and (B and C) Khövsgöl, each colored block represents the proportion of ancestry derived from a corresponding ancestry source in the legend. Error bars show 1 SE. (A) Shamanka_EBA is modeled as a mixture of Shamanka_EN and AG3. 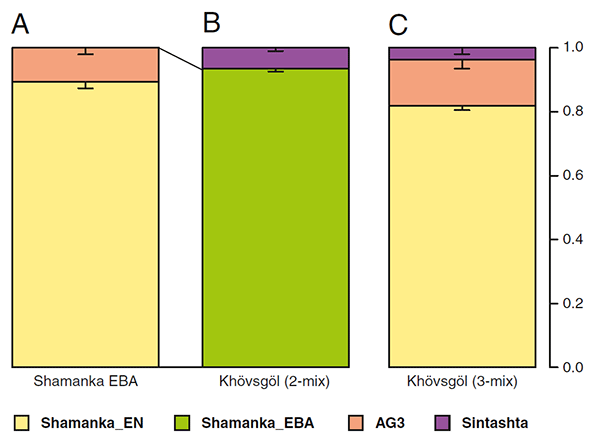 The Khövsgöl main cluster is modeled as (B) a two-way admixture of Shamanka_EBA+Sintashta and (C) a three-way admixture Shamanka_EN+AG3+Sintashta. 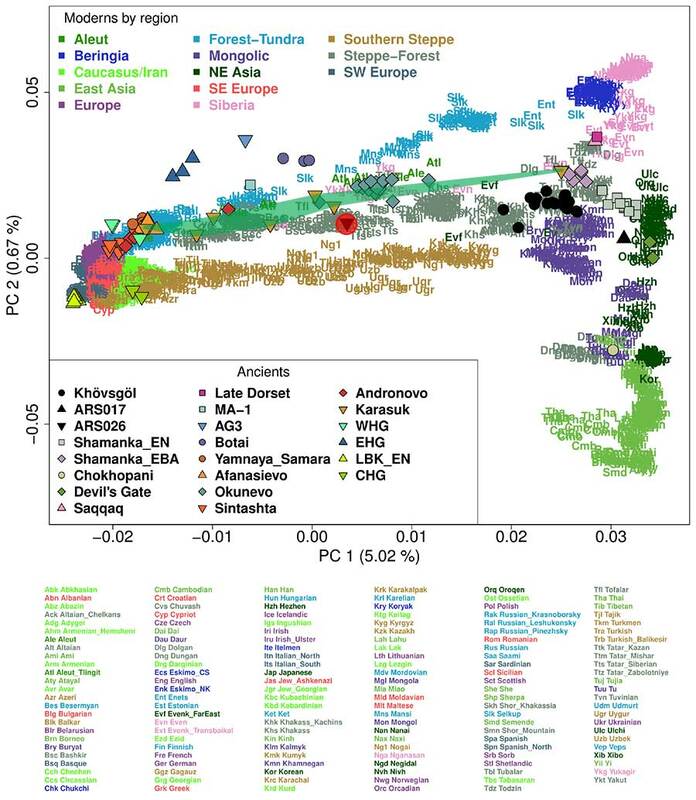 Apparently, then, the first individual with substantial WSH ancestry in the Khövsgöl population (ARS026, of haplogroup R1a-Z2123), directly dated to 1130–900 BC, is consistent with the first appearance of admixed forest-steppe-related populations like Karasuk (ca. 1200-800 BC) in the Altai. 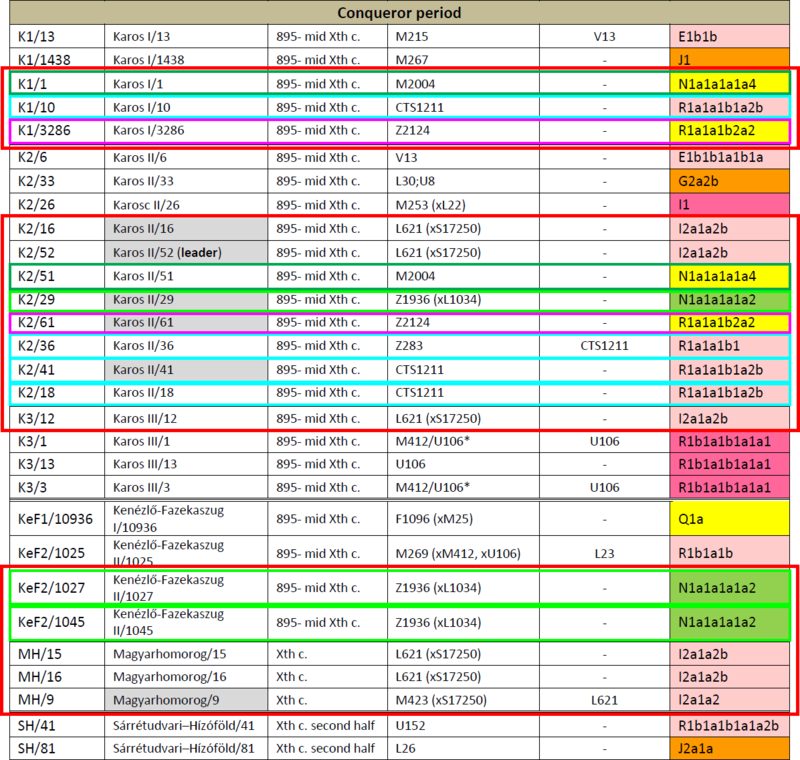 Interestingly, haplogroup N1a1a-M178 pops up (with mtDNA U5a2d1) among the earlier Khövsgöl samples. I will repeat what I wrote recently here: Samoyedic arrived in the Altai with Karasuk and hg R1a-Z645 + Steppe_MLBA-like ancestry, admixed with Altai populations, clustering thus within an Ancient Altai cline. Only later did N1a1a subclades infiltrate Samoyedic (and Ugric) populations, bringing them closer to their modern Palaeo-Siberian cline. The shared mtDNA may support an ancestral EHG-“Siberian” cline, or else a more recent Afanasevo-related origin. Modified image from Jeong et al. (2018), supplementary materials. 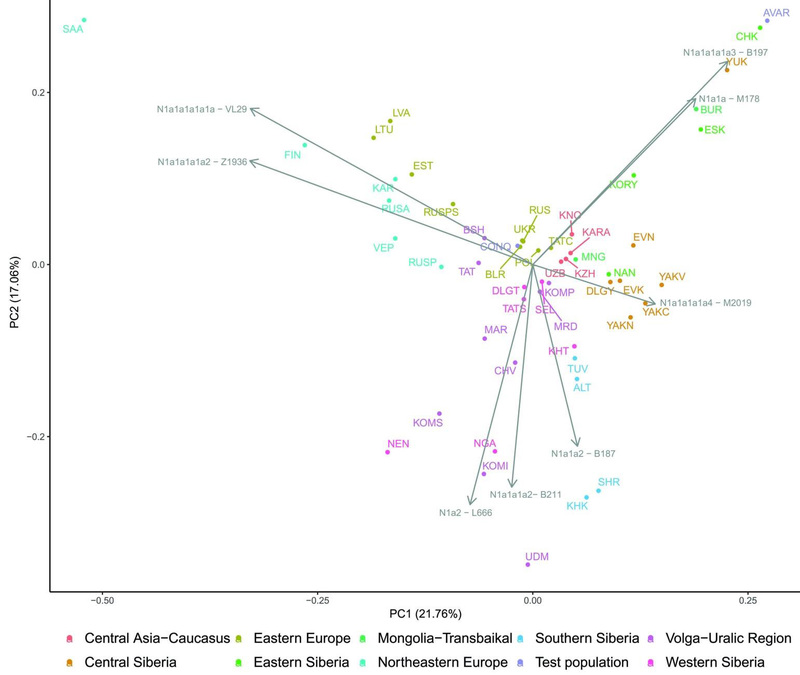 The first two PCs summarizing the genetic structure within 2,077 Eurasian individuals. The two PCs generally mirror geography. PC1 separates western and eastern Eurasian populations, with many inner Eurasians in the middle. PC2 separates eastern Eurasians along the north-south cline and also separates Europeans from West Asians. 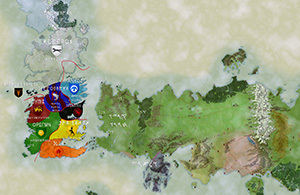 Ancient individuals (color-filled shapes), including two Botai individuals, are projected onto PCs calculated from present-day individuals. Read more. Also interesting, Q1a2 subclades and ANE ancestry making its appearance everywhere among ancestral Eurasian peoples, as Chetan recently pointed out.